For a look at Salem in 1630, tour this "living history museum." 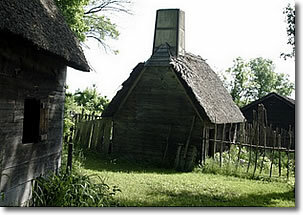 Built in 1930, Pioneer Village in Forest River Park (map) off West Street in Salem, 1.5 miles (2.4 km) south of Salem Common, has been restored over the years. Costumed "interpreters" show you the governor's house, gardens such as the colonists might have cultivated, and the sorts of animals that they may have raised. There's a beach and picnic area, so plan accordingly. Tickets are available at the Witch House, 310 ½ Essex Street in Salem, tel: 978-744-8815.